B2B marketplaces have emerged as the most effective and results-oriented platforms for buyers, retailers, and whole sellers to trade. China has recently evolved as the largest producer of various products. Since businesses are looking for ways to increase their sales dramatically, B2B platforms have helped various businesses in achieving expansion goals. In this article, we are going to reveal the leading B2B marketplaces that can help you to grow your business in the shortest span of time. Alibaba stands as one of the leading B2B portal in the world of online trading. None other than Jack Ma and Peng Lei founded the company about eighteen years ago in China. Alibaba has achieved a remarkable place among the B2B platforms. The company offers a broad range of B2B services to clients worldwide. Moreover, Alibaba stands as a convenient platform for B2B, B2C, C2C, and more trading services. In addition, Alibaba offers Ecommerce, Digital Auction, Online Fund Transfer, Mobile Commerce, and digital shopping to clients. Alibaba holds an honor in owning various companies including Ali Express, Guangzhou, Taobao, UCWeb, AntiFinancial, YouKu, Cainiao, and more companies. According to leading surveys, Alibaba generates a net income of about $6.2 billion and has more than 50,000 employees. EWorldTrade stands as well-established platform offering a broad range of Ecommerce services. eWorldTrade is rapidly expanding its database of clients, helping users to enjoy a broad range of reliable, worthy, and secure experience. EWorldTrade works as one of the best platforms for lead generation. It promotes transparency and quality products. Be it B2B, B2C, Consumer to Consumer or any other form of trade, EWorldTrade is a remarkable online trading platform that offers comprehensive solutions for wide-ranging business activities. As per latest survey, this platform stands as the leading B2B platform that connects potential buyers with sellers. ThomasNet is one of the leading B2B platforms that offers a broad range of goods. ThomasNet caters to widespread demand of various industries with offering more than 490,000 suppliers and buyers. This platform offers a detailed view of supplier, maintaining a secure transparency between sellers and buyers. EC21is a Korean counterpart that provides a client with a broad range of marketing services including universal market research, overseas marketing, trading education program, and international cooperation. This platform facilitates universal trade covering import/export from different regions. EC21 has its offices located in about four different countries including China, Russia, Malaysia, and India. EC21 has about more than 2 million member firms, contributing to millions of hosted goods. TradeIndia is one of the largest B2B platform based in India. This platform stands second to the massive IndiaMart. Similar to other better counterparts, TradeIndia offers basic and exclusive membership to sellers. TradeIndia offers a broad range of service to sellers such as business catalogues, DialB2B, Call Me Free, Trade Alerts, Credit Reports, and Leads. This platform actively participates in the local and international trade events. 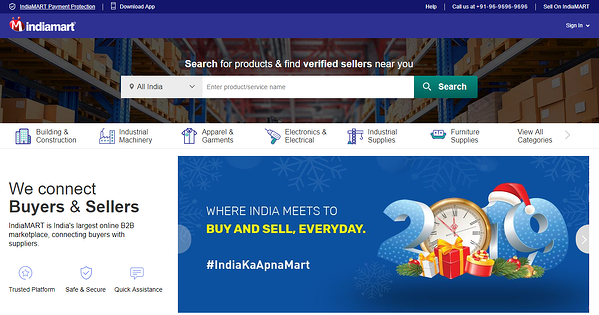 IndiaMart is a leading platform that has become a B2C and C2C platform. IndiaMart has experienced a massive growth since its creation. This platform stands as the second B2B marketplace around the world. IndiaMart has more than 1.6 million daily visitors that is quite impressive, and this number is constantly increasing every day. 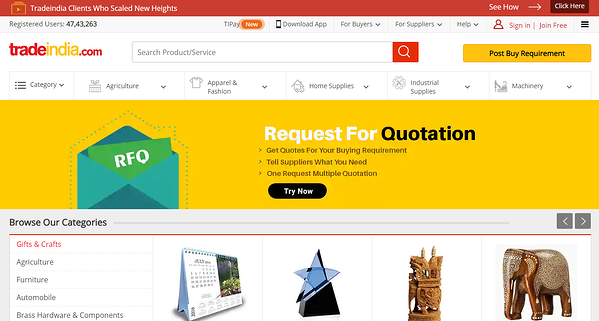 Similar to other B2B platforms, IndiaMart offers basic and premium membership to clients. IndiaMart stands among the largest B2B platforms in India. 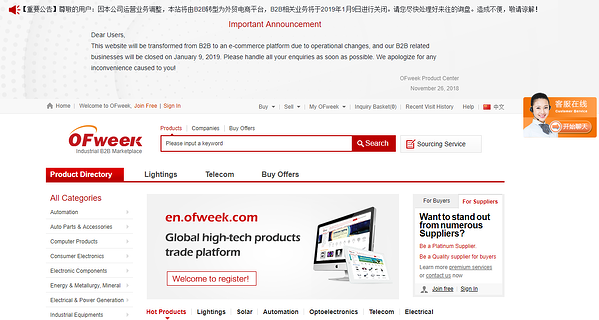 En.Ofweek is one of the fresh contenders in the B2B industry. It is a worthy contender, aiming to cater to requirement of buyers/sellers dealing in electronic products. The platform is based in the China and is known for in-depth reporting system for sellers. Every report is real-time, where platform serves as an arena that has a lot of potential to expand in the upcoming days. Global Sources is one of the leading B2B platforms. It offers exclusive export and import services. The company currently offers trading to prime countries in the world. The mainstream B2B platform has claimed to serve about millions of active monthly visitors. Global Sources has a proven record of offering excellent services improving GDP growth of different countries. Global Sources offers a broad range of products along with a massive inventory including various seller from around the world. The platform is based in China and offers unique media. The B2B platform hosts online trade shows, enabling sellers to display their products in the best manner. The platform hosts great sourcing events allowing the sellers to meet with the potential buyers who can operate retail chains hassle-freely. DHgate is another great B2B platform from China. The B2B platform claims to offer 40 million product listings from more than 1.2 million Chinese suppliers along with 10 million buyers from more than 230 countries. The platform offers distinct features separating the platform from different counterparts. Considering the offerings of DHgate, we consider it as a worthy B2B platform with valuable benefits for buyers, retailers, and wholesalers. China has undeniably become one of the leading trading country in the world. The country has captured various global markets due to cost-effective and high-quality products. 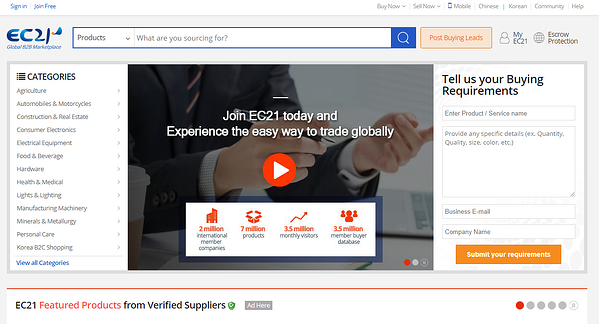 Made-In-China is one of the leading B2B platform that connects sellers from different regions with potential buyers. The platform was built in 1998 under supervision of the Focus Technology Co. Ltd. This platform stand as the well-known marketplace for trending B2B marketing activities. Made-In-China is available in more than 10 languages. The platform offers more than 26 major categories consisting of wide-ranging products divided in about 3,600 sub categories. The platform stands as the first ever Ecommerce website that performs a comprehensive review on paid suppliers. The platform promotes Chinese products and assists brands in highlighting their presence on international level. As the name suggests, Made-In-China emerges from China. The B2B platform assists various sources and ensures product exports from China. Moreover, this B2B platform has boosted the reach of products in different countries. Moreover, the company utilizes Virtual Reality along with 360’ panoramic view to show manufacturing environment along with quality of products made by Chinese vendors. Maker’s Row offers a great platform to businesses, startups, and entrepreneurs. The platform also offers a fantastic community that is expanding increasingly. The company has transformed the way manufacturers had produced products. In addition, this company has a tagline stating “Where ideas become products”. 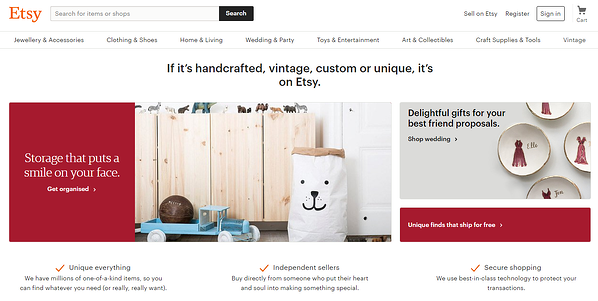 Etsy is widely popular B2B platform, offering great arts and crafts products. The wholesale section is growing fast. Etsy is becoming a great platform for evolving artists and ambitious businesspersons who can’t find such valuable and worthy masterpieces of art anywhere else. In the modern-day business world, Salon Centric has become the leading marketing need. 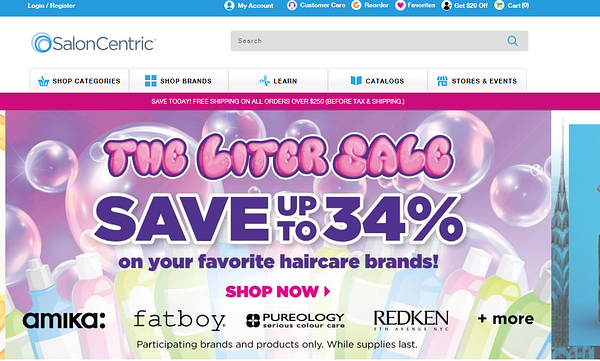 Through offering a broad range of beauty products from different regions in the world, Salon Centric has been able to receive attention of retailers worldwide. Salon Centric is currently based in the United States and is growing at a very fast pace. In case, you are in hope to grow business internationally, you can reach out to Salon Centric and make trade hassle-freely. Joor is based in the United States. The B2B platform deals mainly in the apparel business. Considering the expanding clothing business, global presence of a clothing-focused B2B platform can make a big different for buyers, retailers, and wholesalers. So far, we have revealed the best B2B marketplaces to grow your business rapidly in the competitive landscape. If you know about more leading B2B marketplaces that should be in this article, then feel free to mention about them. What are some B2B Marketplaces? Author Bio: Gerry Wilson is a profound tech savvy person. He loves to write about the leading tech trends. With having his content published on the popular tech sites, he searches about the technological advancement that will be reshaping our lives in the upcoming days. At times, when Gerry is not busy in writing, he is creating videos, eBooks, and attending webinars. Follow on twitter for further details. Are you making the biggest mistake in B2B eCommerce? Find out the simple error that causes B2B online failure and how to avoid it.